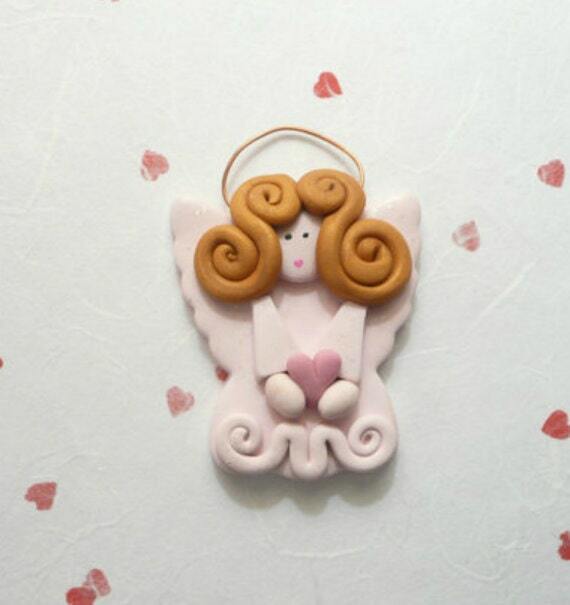 An angel magnet is the perfect way to show appreciation for the "angel" in your life! Handmade of polymer clay with a copper wire halo, hand painted face, and wings accented with gold acrylic paint and sparkly gloss. Lightweight, measures about 2" (5 cm) tall plus the halo. Display on the fridge or office file cabinet ... add a ribbon to use as an ornament for Christmas or year-round hanging wall art. ★ This listing is for the angel with the PINK DRESS as shown in 1st and 2nd photos. ★ IF YOU'D LIKE DIFFERENT COLORS, please "request custom order" or purchase this listing and message me at time of purchase. See 3rd photo collage for samples of other colors. ★ RIBBON FOR ORNAMENT: Choose "add a ribbon" and I'll include a matching ribbon at no extra charge. ★ NOTE: Each one is handmade and will vary slightly from photos. "Angels around us, angels beside us, angels within us. Angels are watching over you when times are good or stressed. Their wings wrap gently around you, whispering you are loved and blessed."